Located at the eastern end of the Helan Mountain Range, 30 km west of Yinchuan, the Western Xia Imperial Tombs cover an area of 53 square kilometers. 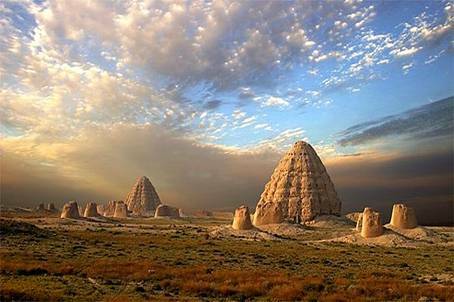 Located at the eastern end of the Helan Mountain Range, 30 km west of Yinchuan, the Western Xia Imperial Tombs (西夏王陵) cover an area of 53 square kilometers. Known as the "Eastern Pyramids," the site includes nine imperial mausoleums and 250 tombs of imperial relatives and officials. The tombs glitter gloriously under the bright sun. The Western Xia Dynasty existed from 1038 to 1227 in the area now covered by the northwestern Chinese provinces of Ningxia, Gansu, eastern Qinghai, northern Shaanxi, northeastern Xinjiang, and southwestern Inner Mongolia. Tombs of the imperial family embody the culture of Tang (618–907) and Song (960–1279) Dynasties and were also strongly influenced by Buddhism. The scenic spot is one of the largest and best preserved imperial mausoleums in China. In 1988, it is recognized as a key cultural heritage site under State protection and a national key scenic spot. 3. There are many restaurants. 2. Self-drive car via Highway 110.